Whenever I study for a certification exam, I often find this type of post helpful, so I hope this one will help you too. 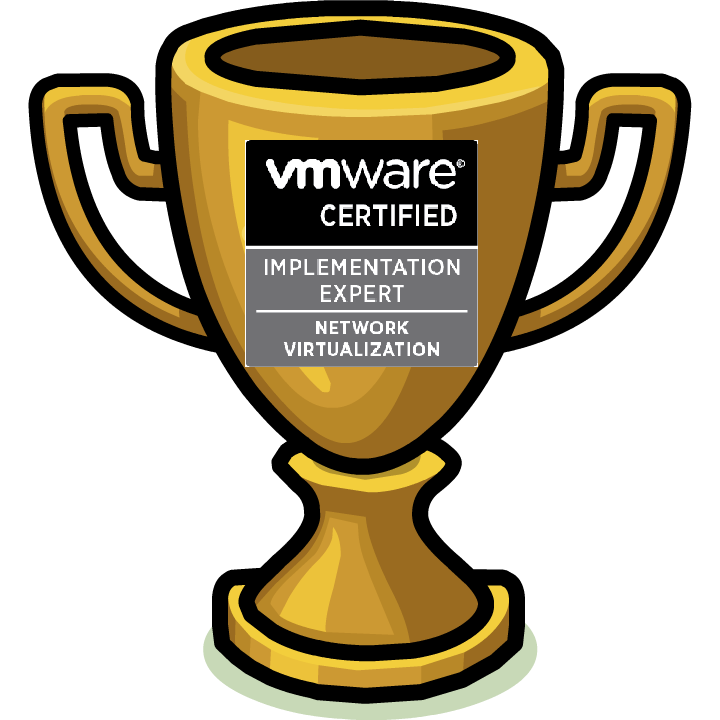 The VCIX-NV exam is the advanced level of certification for VMware NSX in the Network Virtualization track. If you plan on passing this exam, you'll need a good breadth of knowledge regarding not only the NSX-v product itself, but also some advanced networking concepts. Personally, I found this to be the most difficult VMware exam I've taken so far. The topics covered were fair, nothing was asked that was not clearly defined in the blueprint. I found the tasks to be fairly difficult, compared to what I had experienced in other VCAP exams. So this is one exam that you'll really need some hands on experience to pass (real life or a lot of labs), I believe it will make passing the exam very difficult otherwise. The version of NSX used for the exam was 6.0.4, so you can expect some minor differences if you're used to the latest versions, 6.2.x. The exam environment was not as slow as I expected, there was lag, but it wasn't so slow that it crippled the entire experience. My Firefox browser did crash a few times though and I did have to restart it, but other than that, no major hiccups with the lab's performance. I guess living in Canada helps, since the nested labs that are used for the exam are supposedly in the US. I got my result only a few hours after finishing the exam, luckily enough I passed! By no means am I a networking expert, but working towards and passing this exam made me much more comfortable with my networking skills in general. It goes without saying that you will need to know NSX in-and-out, you can use the resources below to help you get there. However, the VCIX-NV exam blueprint mentions that the intended audience needs not only experience with NSX, but also with "Windows desktop administration, including Active Directory, group policy, DNS, and DHCP". I would take that a step further and suggest you should at least be comfortable with most of the subjects covered in Cisco's CCNA exams, ICND1 and ICND2. Knowledge of VMware virtual switches and virtual distributed switches alone is not sufficient for this exam and you will need to make sure you are comfortable with most of these advanced networking concepts. So if you don't have a strong networking background, be prepared to step out of your comfort zone, because you're going to need to! – The VMware NSX: Install, Configure, Manage course is always a great resource, if you can afford it. – Pluralsight's 2 courses by Jason Nash, this is a great place to start. – Most importantly of all, a ton of hands on experience with the product. This can't be emphasized enough, especially since this type of VCAP/VCIX exam is entirely done in a real lab environment. So if you don't have an existing lab environment to test everything in the blueprint, give the VMware Hands On Labs a spin, that will take care of most of your needs. Labs HOL-SDC-1625 and HOL-SDC-1603 are a good fit for this. Keep in mind the version of the HOL environment might not match what you'll see in the exam. – As you know, time management is a major challenge in this exam, like all VCAP exams. So try to save time by working on multiple questions at once, as much as you can. For example, if you're deploying an Edge Gateway, don't wait and stare at the progress bar, start working on the next question! – Open as many tabs to your browser as possible to keep certain parts of the UI open and one click away. Others seem to indicate that the lab environment's latency limited their ability to do this, but I was lucky enough to be able to open everything I needed at once and made going from window to window a breeze. – The exam is 3 and a half hours long (+30 minutes for people in a country where English is not a first language), and jam packed with content. So many things can potentially go wrong and ruin your exam experience, so no matter what happens, you just need to make sure to stay cool and focused on the objective at all times. Make sure you have the energy to do so, have a good breakfast! Good luck on your preparation and exam! Thanks, I have started for the exam preparation, the info you provided helps to me start with more approaching way. I have my CCNA and work at a company that recently deployed NSX. Thanks for the info. Good info… could you please suggest the real lab environment ? Hi Shazad, the best way to get started quickly is to use VMware’s free Hands on Labs, give it a try : hol.vmware.com. Congrats on passing the VCIX-NV. For others out there, I also have a VCAP6-NV/VCIX study guide.